In a very real way, the Du Bois Center at Great Barrington was years in the making. Its genesis is rooted in local school committee and selectmen meetings, school names, road signage, a bookstore, community forums and scholar retreats, churches and schools, historical societies, and a cemetery…. The Du Bois Center opened in February 2006. Located just south of Main Street, Great Barrington, it abuts the Mahaiwe Cemetery, where Du Bois buried his son Burghardt (1899), first wife Nina (1950), and daughter Yolande (1961). A marker at the Du Bois family gravesites, erected by the Great Barrington Historical Society, bears the W.E.B. Du Bois quotation, “In 1950 the month of February had for me special meaning. I was a widower. The wife of 53 years lay buried in the New England hills beside her first- born boy.” The Mahaiwe Cemetery is an essential point of entry into understanding Du Bois’s life. Visitors from as far away as Africa, where Du Bois was buried, come to pay their respects. Although philanthropic groups from Berkshire County had honored Du Bois in meaningful ways for decades, many residents remained unaware of his local roots and historical importance. By 2004, however, two events received such widespread media coverage that “Du Bois” became a local household name. They affected the community in profound, unsettling, embittered, and, eventually, quite inspiring ways. The first event centered on naming Great Barrington’s newly constructed elementary or middle schools after Du Bois, “a man whose life is a testament to the life-transforming potential of public education.” The second event centered on honoring Du Bois through road signage. They also helped to propel the Du Bois Center into being. The school committee directive drew angry responses from the community. One local historian deplored the reference to an ethnic group as “an ethnic slur and many would consider it downright bigoted in attitude and implication.” Under mounting pressure, the committee acquiesced and decided to accept suggestions for names, with established guidelines for submissions. Articles, editorials, and letters to editors began to appear in Berkshire County papers. The issue of race became a polarizing force, placing local government officials on the defensive in the face of allegations of racism by members of the public…. [T]he historic exclusion of blacks in the physical and symbolic New England landscape… will affect the future of the town – as the children who participated in the debate eventually reflect, debate and decide on their own version of the past and vision of the future. In New York City, trombonist-composer Craig Harris, at work on a multi-media production inspired by Du Bois’s landmark publication The Souls of Black Folk, called the school naming “fiasco” a “moral travesty.” He visited Great Barrington several times to support the “most righteous of causes.” Local students participated in a school-naming contest sponsored by North Star Rare Books. Harris honored the winners with a special performance at St. James Episcopal Church. The decision to name the two new schools Monument Valley and Muddy Brook has been made. I take much pride in my community and my children have always trusted adults to do the right thing. Not knowing how to answer their question, I played it safe and said that valleys and muddy brooks were important too. Weeks after the school naming debacle, a local retired veteran first suggested that Great Barrington install road signs designating the town the “birthplace of W.E.B. Du Bois.” Town selectmen, by a majority vote, rejected the proposal. Significant Du Bois- related activities ensued. Local groups addressed National Public Radio listeners and audiences at senior centers, Rotary and Kiwanis Club meetings, and area schools, including Williams College, Simon’s Rock College of Bard, and Berkshire Community College. The Great Barrington Historical Society, the Southern Berkshire Chamber of Commerce, Democratic and Republican town committees, and various religious groups endorsed the commemorative signs. The AME Zion Church, Great Barrington, hosted a Du Bois birthday celebration. Craig Harris performed his new Du Bois-inspired work, Souls Within the Veil, at the Mahaiwe Performing Arts Center. The community seemed eager to learn more about Du Bois. 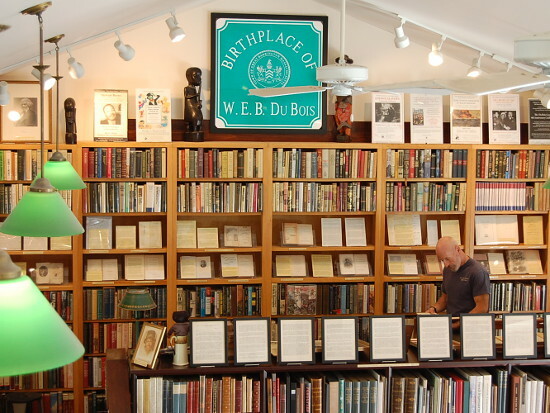 In May, North Star Rare Books exhibited a comprehensive collection of Du Bois books, manuscripts, and memorabilia. That same month, the Great Barrington Historical Society and North Star Rare Books sponsored a public forum at the town’s community center. One hundred people came to hear an informed panel explore Great Barrington’s ongoing “love/hate relationship” with Du Bois. Many in attendance spoke about the need to disseminate “truthful” information, perhaps through the creation of a center dedicated to local history, replete with a Du Bois museum and an educational component for area children. In a most profound way, town selectmen have made history…. Let there be no mistaking the fact that from the vantage point of the 21st century, Du Bois’s politics, at times, appears naïve, even wrong-headed. Yet politics aside, his contribution to the 20th century’s civil rights movement was righteous, global, and indelible. From Ghana, where he spent his last days, to Great Barrington, where he spent his youth, and, now, officially acknowledged for the first time, Du Bois’s life and legacy have come full circle. And for this, in great part, we must credit our present town fathers. A less charitable resident of Great Barrington insisted that the selectmen had been “shamed into doing the right thing.” A school psychologist, disagreeing, maintained that the once-polarized community had thirsted to learn, wrestled with its demons, changed, and voted (850-431) to embrace the legacy of its famous native son. Townspeople had spoken, town fathers had listened. The time seemed ripe to establish the Du Bois Center at Great Barrington. Shortly after the town officials approved the Du Bois signage, efforts began in earnest to secure a suitable space adjacent to the Mahaiwe Cemetery, raise the necessary capital, file as a nonprofit organization, amass a comprehensive library and historical artifacts, plan innovative programs for the community, and create a board of directors and national advisory board. The Center officially opened on February 11, 2006. Despite the threat of a blizzard, some four hundred people gathered at St. James Episcopal Church, where Du Bois’s family had worshipped, and afterward attended the reception at the Center. A panel discussion, “Du Bois and the Promise of America: the Color Line since 1865,” featured board members Lewis, Blight, and Simon. Their conversation touched upon a variety of subjects, including the Center’s significance within the context of Great Barrington’s stormy relationship with Du Bois and Du Bois’s place in the American memory. The Du Bois Center Great Barrington Historical Society, Mahaiwe Cemetery, marker, 1994; Shirley Graham Du Bois, His Day Is Marching On (Philadelphia: J. B. Lippincott, 1971), 317. Several of Du Bois’s uncles, aunts, and, perhaps, his mother were also buried in the Mahaiwe Cemetery. Although philanthropic Berkshire Eagle (June 9, 2005): editorial. During a regional Berkshire Eagle (August 7 and 12, 2004): articles; conversation, GB school administrator and Randy F. Weinstein (November 19, 2004). The school committee Berkshire Eagle (October 22, 2004): article. Articles, editorials Berkshire Eagle (July 5, 2004): letter to editor. A local historian Berkshire Eagle (July 17, 2004): article. One journalist Berkshire Eagle (August 10, 2004): editorial. The real issue Berkshire Eagle (June 27, 2004 and May 20, 2005): editorial and letter to editor; Bernard A. Drew, Dr. Du Bois Rebuilds His Dream House (Great Barrington: Attic Revivals Press, 2006),115. The struggle over Boston Globe (October 23, 2004): editorial; Berkshire Eagle (September 19, 2004): letter to editor. In New York Conversation, Craig Harris and Randy F. Weinstein (December 19, 2004); Berkshire Record (November 5 and December 17, 2004): articles. Weeks after Berkshire Eagle (January 19 and 27, 2005; February 13, 2006): editorial, article, and letter to editor. In January Berkshire Eagle (January 24 and May 5, 2005): letters to editor; WAMC radio interview, Susan Arbetter and Randy F. Weinstein (February 10 2006); Berkshire Record (April 1 and 20, 2005): articles. The community Berkshire Eagle (May 5, 2005): letter to editor; Berkshire Record (May 13, 2005): article; conversation, Edgar Jacobs and Randy F. Weinstein (May 17, 2005). Extensive media Berkshire Eagle (June 9 and August 31, 2005; January 21, 2006): letter to editor, article, and letter to editor. A less charitable Conversation, James Sitwell and Randy F. Weinstein (January 14, 2006); conversation, John Zola and Randy F. Weinstein (January 19, 2006). The time seemed Berkshire Record (September 9, 2005; February 3, 2005): articles. The Center officially Berkshire Record (February 3 and 17, 2006): articles; Berkshire Eagle (January 28, 2006; February 8 and 13, 2006): editorial and articles. “Barringtonians” Email, David L. Lewis and Randy F. Weinstein (February 14, 2006); conversation, Carl Kaestle and Randy F. Weinstein (February 11, 2006); Advocate Weekly (February 16, 2006): article. Perhaps Craig Berkshire Eagle (June 9, 2005): letter to editor.